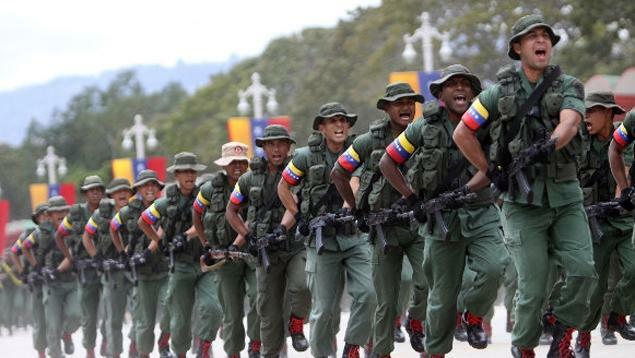 The latest senior military officer to defect from the Nicolas Maduro government claims that 90% of the armed forces are "unhappy" with Maduro and stand ready to defect, according to The Times. He's been further described as deputy of the Directorate of the Military Hospital in Maracaibo and the timing of his defection is interesting given the contested issue of US humanitarian aid. Bolton recently invoked the "authorization" of Interim President Juan Guaido to ship humanitarian aid into the country including "medicine, surgical supplies, and nutritional supplements for the people of Venezuela" according to his statement. He urged Maduro "to get out of the way". Meanwhile the socialist government in Caracas insists it isn't experiencing a humanitarian crisis; instead Maduro has slammed US aid to the country as a "political show". Interestingly, prior to this latest defection of military doctor Col. Paz, another high ranking officer had cited the exact same "90 percent" figure describing armed forces who are actually against Maduro. The highest ranking armed forces member to defect thus far, Air Force General Francisco Yanez, who was part of the air force's high command, in his own video message early this month claimed a wave of defections is coming. Last month National Assembly leader and now US-recognized "Interim President" Guaido first began appealing to the military to switch sides following a local and short-lived attempt of 27 officers to lead a revolt on Jan. 21, quickly put down by security forces after they stormed an armory and police checkpoint. To encourage more such defections, which so far hasn't appeared to penetrate the top layers of military leadership, Guaido has offered amnesty protection to any officer previously accused of corruption or human rights abuses should they defect. But so far there's been a tiny - we might even say insignificant - trickle as the country's most powerful institution continues to stand by Maduro's side against "foreign aggression" and the regime change rhetoric issuing from the White House.